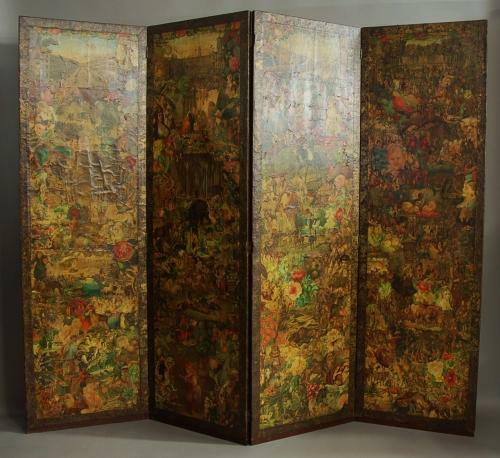 This screen consists of four stained wooden panels, each decorated both front and back with decoupage embellishment which was popular at this period. The word decoupage is a French word and means 'cut out': it consists of cut out designs or images applied with glue that overlap to cover the entire surface and usually finished with a few layers of varnish. This screen consists of many superb polychrome printed images and is a very decorative piece as well as being practical. Both the frame and panels are in excellent original condition.